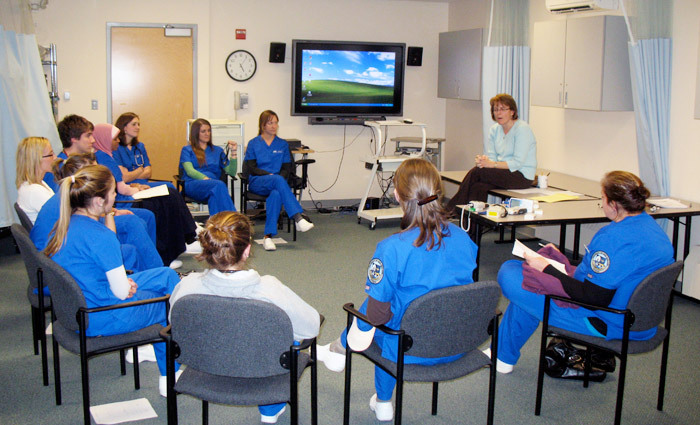 Debriefing should occur after every simulation scenario. It’s where most of the learning happens, and where you will discover most about your participants. It is a skill which needs to be learnt, and you can easily mess it up, leading to trauma for the participants (and you)! Don’t undertake debriefing without doing some reading on the subject first, or better still, attending a course (of which many are available, see Links). Then have a plan for the debriefing session – where it takes place, what time is allocated, who will lead and what structure you will use. As the participants walk away from the simulation area, you’ll here them talking, often excitedly, about the scenario. This is part of the debriefing process – they are letting off steam. You want to catch these initial reactions, which is why it is important to follow them to the debriefing area as quickly as possible. For this reason, a lot of simulation trainers have pre-determined subjects or issues they wish to discuss in debrief. Others pick issues up while observing the scenario. I tend to use a mixture of both techniques, having one or two pre-determined issues and adding in another one or two while observing. It is good practice to have a rapid face-to-face discussion with any fellow debriefers or the nurse or doctor who has proposed the scenario to identify the issues before debrief. The nurse educator and I usually do this while the participants are making their way to the debrief room. We take 30 seconds or so to agree on what we should discuss. Be careful not to have this discussion in the simulation space if you have AV capability – you don’t want everyone to see and hear this discussion! Debrief should have a structure. See ICU Sim Debrief Guide for an example. This is based on the Centre for Medical Simulation structure and uses the principles of ‘Debriefing with Good Judgement’ by Jenny Rudolph et al. Let’s face it, when you watch a scenario, you make judgements about the team performance. You are doing a disservice to your learners if you don’t use this judgement to shape the debrief, either to re-enforce good performance or investigate poor performance. The aim is to use good judgement to guide you, avoiding harsh judgement and hidden judgement. The latter refers to the situation where the facilitator keeps their opinions under wraps, a style of debriefing that used to erroneously be called non-judgemental. To avoid this, you should share your judgements, in a non-confrontational way, and not ask the learners to try to work out what you think (the old GWIT technique: guess what I’m thinking). The added advantage is that, during the process, you also let the learners know how you think they did, which they want to know from you, their mentor. Debriefing with good judgement takes us away from the waste-of-time s**t sandwich approach and uses advocacy with inquiry to find the learner’s frames of reference.Robust feedback is given, to appraise learners of how they are performing, re-frame wrong frames and fill knowledge gaps. It’s been an epiphany for me on my debriefing journey. Let’s go through the structure. The ‘feelings’ section is to allow the participants to vent and so you can get their initial impressions of the scenario. Some of this venting might have happened before you enter the room, so it’s a good idea, if one of the faculty has been observing, for them to listen out for important comments at this stage. When you ask the participants :”how do you feel about that scenario?” you can get a range of responses. It’s common for them to say “it was awful”, or “we were awful”. Let them talk. Try to resist the temptation to say “no, you weren’t” (they might have been! ), and let them talk. You want to find out why that participant thought it was awful, but not at this stage. You can say something like “we might investigate why you think that..” or, “we’ll see how everyone else thought you did..”, or nothing. They might say “it was chaos”. It may or may not have been a chaotic scenario (in your view), but it might have been perceived that way. You can earmark that as an issue to discuss (the management of chaos in a complex clinical scenario), but don’t quiz the participant about it at this stage. It’s important to establish the medical facts of the case at this stage so that everybody (including the observers who may not have picked up the more subtle cues) knows the diagnosis and the treatments which were given. You can use this section to establish whether the whole group was aware of the diagnosis or just the team leader, and how certain they were about it. You can ask participants or observers to outline the specific and supportive treatments that were given, and discuss any further interventions which might have been offered if there was more time. Getting the medical story straight at this point is important because if there is uncertainty about the diagnosis, the discussion of the issues that arose will have less meaning to the participants. This is where advocacy with inquiry comes into play. An advocacy is an assertion, observation or statement about a particular action or behaviour in the scenario. For example, you might say: “Just before the patient was anaesthetised for intubation, I noticed that one milligram of intravenous adrenaline was given.” You need to explain why you are raising the issue..”this puzzled me because it seemed to me that the patient had a reasonable blood pressure at this point and I would usually only give a whole milligram of adrenaline in cardiac arrest”. Notice the passive wording here: “it seemed to me”. This wording is deliberate: you might have your facts wrong – the monitor may have showed no blood pressure at that point, or the team leader may have been told that there was no pulse by another participant, a discussion you might have missed. Now comes the inquiry. We are trying to establish the reasons why the leader or group decided on their course of action. Notice we are trying: we are on this journey of discovery together, with you as a debriefer helping with the investigation. “I was wondering what was going on in the scenario/amongst the group at this point which made you choose one milligram”. There are many potential responses to this advocacy/inquiry. The group may be unaware of the dose which was chosen, or may have forgotten. This is where video can be useful – to re-play this moment and trigger memories of the motivation behind the action. The leader may have meant to give a smaller dose and made a simple error of communication. Alternatively, the leader may have thought that the patient was in cardiac arrest, may not have been able to see the vital signs monitor, or may have seen it but not taken the information in. Finally, the leader my truly believe that giving one milligram of adrenaline is appropriate in this setting, and you can ask them to explain why. If you believe that the reasoning behind the action is flawed (that the team leader or group has a flawed frame of reference), you can lead a discussion on this point. The desired outcome from this process is that you re-frame the group or individual to the correct frame of reference, which, in this instance, is that adrenaline should only be given in small doses in patients with a cardiac output. This style of debriefing avoids the inefficacy of non-judgemental debriefing, whereby the facilitator makes no judgement about the performance of the participants, thus making no effort to change behaviour. It seeks to modify behaviour by discovering and changing, where necessary, the belief systems or reasoning behind actions and behaviours. If done correctly, this process can be collaborative and not openly judgemental. A summary of the main learning points and issues discussed is useful, then there is the option to ask for ‘take-home messages’ from the group. These can be sought from participants and observers – keep it to three or four to avoid repetition. Debriefing is an art, and your skills in this area will develop over time. It is a good idea to reflect on your debriefing sessions, or ask for feedback from your fellow debriefers, participants or observers (debriefing the debriefer).